A member of the board of the Presidency of the Council of Representatives Hamoudi, on Monday, that the reform process is everyone's responsibility, not an individual matter. He pointed out that "the reform process is everyone's responsibility, not an individual community has an active and influential role as the official media and the roles of another actor, especially in the implementation of the follow-up procedures and laws." 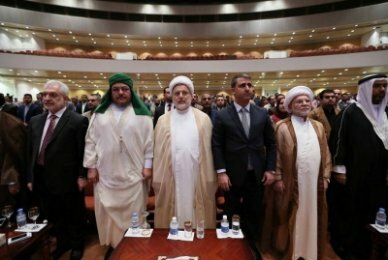 He said Hamoudi during a speech at the celebration of Eid al-Ghadeer Trafalgar which was held under the auspices of the board of the presidency of the House of Representatives at the parliament building "One of the lessons that Nstekayaa than one occasion Bourne and honor the divine person of Imam Ali [p], is that we should distinguish the faithful loyal truthful, and we honor those making the march in sacrifice and jihad and tender as well as the integrity and performance of duty. " And presented by First Deputy Chairman of the Board during the celebration, "a special tribute to the families of the martyrs of the popular crowd, and some state institutions excellent performance of the civil service to citizens Kdairta health Najaf and Baghdad's Rusafa and the Department of the People's medical clinics, in addition to the Eye Foundation for Social Welfare Foundation or the orphan Development and the Department of ideological guidance in the board of the popular crowd and high integrity for Girls "